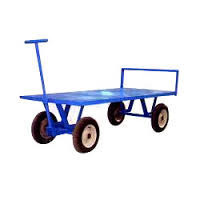 Our range of products include concrete trolley, construction trolley and four wheel trolley. As a leading manufacturer and supplier of Two wheel trolley, we have achieved great laurels for our company. These are extensively sought after for their usefulness, high performance and durability standards. These material handling trolley are invaluable to transfer and shift construction material from one place to another effectively. These are designed as per the set industry norms and protocols and are made available to our customers at industry leading rates. We always assure that our products do not compromise on the quality aspect.